British Sign Language (BSL) is the visual language of Britain’s Deaf Community. It is a language that is completely unrelated to English (or any other of Britain’s spoken languages). It is not universal, and most countries have their own sign language, so British Sign Language is different from Irish Sign Language, French Sign Language or German Sign Language, for example. We do not know exactly how many people use BSL, but estimates of the number of Deaf signers who use it as their first language range from 30,000 to 70,000. Many hearing people also know some BSL because they might have family members, friends or colleagues who are Deaf, and recent figures from the British Deaf Association suggest that on any day up to 250,000 people use some BSL. BSL is used across the UK, although there are considerable differences in regional dialects. The BSL used in Belfast, for example, is very different from the dialect used in the Channel Islands. Many of the regional signs have their origins in the residential schools for the Deaf that existed in the 19th and 20th centuries. Children and teachers in these schools often developed their own particular signs, which were also used in the adult Deaf communities in these areas. Despite the large range of differences, there is a strong feeling within the British Deaf community that the sign language is a single language, and most signers have no problem communicating with each other across regional dialects. BSL has a history of oppression by hearing people, who have often misunderstood the language, wrongly believing that it was nothing more than a collection of ungrammatical gestures. In fact, it is a richly expressive language, with a full grammar (one that is based on space and timing), a creative and adaptable vocabulary, and a long cultural and artistic heritage, with complex and original signed stories and poems. In March 2003, it was finally recognised by the British Government as being a full, independent language. This recognition has been important for the status that it has given BSL and its Deaf users. 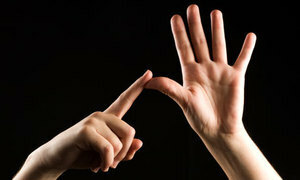 It also means that money is now being invested in training more Deaf BSL tutors and BSL-English interpreters. Schools have been important to BSL because most Deaf children have hearing parents and only learn to sign when they meet other Deaf children at school. For most of the 19th century, BSL was used in schools and widely accepted in society. However, for most of the 20th century, hearing educators banned BSL in schools for Deaf children, insisting that they should speak and lip-read instead. Children were ridiculed and punished for signing in schools, but the language did not die out. In the UK, 5-10% of Deaf children have Deaf parents, and it was these children who helped to keep BSL alive in secret in schools, teaching signing to other children when teachers were not looking. When children left school, they often joined their local Deaf club where BSL was also valued. Today, BSL is used in increasing numbers of public places and is seen on television, at theatres, in universities and at public meetings and conferences. Since the 1980s, most residential schools for Deaf children have closed and children are now educated in ‘mainstream’ schools with hearing children, so their access to BSL and other Deaf people is more limited. However, the language is still a central focus of many Deaf people’s lives so that, for them, to be Deaf is to be a signer of BSL. Sign language is surrounded by many myths and misconceptions. Most people who hear think that signing is merely a manual representation of the spoken language which is not true. In fact, the spoken language and the language of the deaf have very little in common. Sign language has the complexity of the spoken language but it is independent from the latter. The best evidence are British Sign Language (BSL) and American Sign Language (ASL) which are unintelligible despite the fact that the hearing people from the United States and Britain perfectly understand each other. The official language of the deaf in the United Kingdom is British Sign Language (BSL) which was recognised by the Government as a language in its own right in 2003. BSL is used throughout the United Kingdom including North Ireland although the deaf in the latter also use Irish Sign Language (ISL) which is completely different from BSL. The history of BSL is not well-documented because BSL is an unwritten language. Written records that we have of BSL in the past are usually in English, and often written by non-signers. We do know that Deaf people were signing as early as the 16th century, and we can assume that wherever Deaf people met before then, they would have signed together. Most people think, though, that BSL as we know it today began in the 18th century with the growth of towns in Britain so that large numbers of Deaf people were close enough to form their own communities. When Deaf schools were opened in the 19th century, BSL became an established language. The schools opened independently in different regions. There was considerable communication between the schools and teachers often moved between schools but there was no central training in BSL, so a wide range of regional dialects developed. Deaf people have always travelled long distances around Britain to attend Deaf events, and this has helped to create and maintain a single language in the country. As well as having regional dialects, BSL also has differences across the generations. The signing of older Deaf people is often very different from the signing of younger Deaf people. Many signs that are recognised as ‘regional variants’ are used by older people, and there is some evidence that dialects are less strong among younger signers. Although there is a method for writing BSL, most people do not write it (most Deaf people who want to write something will use English, which is their second language). This means that there is no written ‘standard’ form and there is no single dialect that is recognised as high-status, so that all regional dialects have equal status. Since 1980, BSL has been broadcast regularly on television, making signs visible to the whole nation. The result of this appears to be that most signers have their own regional signs but also know a sign that is recognised across the country.